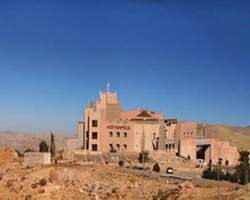 Mövenpick Nabatean Castle Hotel is a 10 minute drive from the entrance to the historic site of Petra, situated in a breathtaking secluded position on a hillside at an altitude of 1,400 metres. All the hotel’s 92 rooms and suites are spacious and most have extraordinary views over the Great Rift Valley. Interconnecting rooms and non-smoking rooms are available on request. All rooms are equipped, hairdryer, digital satellite TV, direct-dial phone, coffee and tea-making facilities and air-conditioning. Superior room, measuring 30 sqm, with 2 single beds, a balcony, sitting area and high ceiling. Spacious room with twin beds, decorated in light natural colours with a high ceiling and small balcony. 30 sqm Deluxe Room with twin beds and a superb panoramic mountain view. Furnished in wood, with a writing desk and balcony. All Suites are a spacious 60-75 sqm featuring a comfortable sitting room and separate bedroom with king size bed. All have a writing desk and dining table and some feature a spacious dressing area with additional wardrobes and a large terrace of up to 30 sqm. One Executive Suite with connecting door to a Standard Twin Room is available upon request. The Movenpick Nabatean Castle hotel’s Al Madafa main dining room, each with its own terrace, invite you to relax and enjoy life. An elegant meeting room with marble floors, gothic pillars, natural light and a skylight. Equipped with its own toilet facilities. The Ayla Meeting Room includes and an adjacent terrace that is ideal for coffee breaks. The perfect location for board meetings. Recreational facilities cater for young and old, whatever the weather. Swim in the 110-square metre heated indoor pool, or relax on the large outdoor terrace after a strenuous workout in the fully equipped gym. For gentler pastimes, the Al Hikmah Library features a vast collection of books on the region as well as family games. A fireplace sets the tone for relaxing winter evenings and the little ones are entertained all year round at the Fun Factory with its numerous toys and games.